wondering what the title means ? thats japanese ! thats what you tell your instructor at the end of a karate class... and why am i telling this now ? 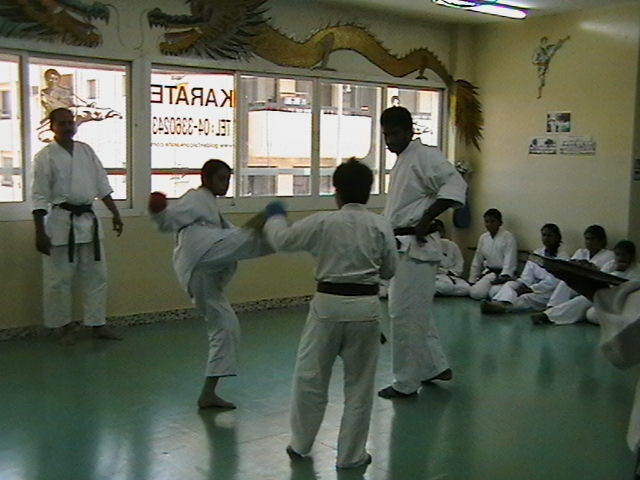 just got the wonderful news that my niece Gayathri (aka Ponni) received her 1st dan black belt today (25th May 2006) !! wowowowow !! cool, isnt it ? here's she doing a roundhouse kick on some other kid, as a part of her black belt test and another pic of her when she was little more young. she is very young (not even in her teens), pretty, tall and good in her studies too. those who wish to congratulate her may do so in the comments section. thats me signing off for now. have a great long weekend ! The setup was pretty easy - dint take up much of my time. And thus my official blog was born on 19th May 2006 at 4:00 pm EDT. Anyways, thanks for taking time to visit my site. Feel free to add your valuable comments. I can also be reached at cpsabari AT hotmail DOT com. For those who don't know me and accidentally came to this site, here is a brief profile of yours truly. My name is Sabari (some of my friends call me Sabs - maybe thats more convenient for them ! ), born and brought up in Trivandrum which is the capital city of Kerala in India. Keralites proudly have named their state as GOD's OWN COUNTRY which is highly debatable now. I'm married to a wonderful girl Meghana who is from Bangalore - nope, its a not a love marriage :) We are now proud parents of two super duper kids - Rohan and Ankit. Rohan is 3 years and 8 months old and Ankit is 1 year and 8 months old. I will try to add more information and pictures of my family in the next few days (or will turn out to be next few months ?). Anyways, have a great weekend ahead.